Britain is to ratify a global treaty to help reduce the 300,000 seabird deaths caused every year by long fishing lines - often used to catch tuna. 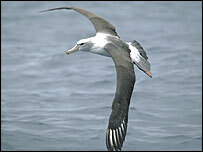 Fishing vessels using the waters of ratifying countries must take measures to protect albatrosses and petrels. Measures include setting lines at night, using bird-scaring streamers and weighting lines to make hooks sink. Britain's overseas territories the Falklands, South Georgia and Tristan da Cunha are the birds' breeding grounds. Countries ratifying the Agreement on the Conservation of Albatrosses and Petrels will also be required to protect the birds' breeding grounds, reduce habitat loss and tackle marine pollution in the waters under their jurisdiction. Dr Euan Dunn, of the Royal Society for the Protection of Birds (RSPB) and BirdLife International, said: "UK ratification is welcome and timely news and a hugely significant breakthrough in our battle to prevent albatross extinctions. "All 21 albatross species face extinction - but this threat can still be reversed if more countries ratify this treaty and take decisive action. "This move by the British government should be a powerful catalyst for that to happen." "The strength of the treaty is in its international cooperation to protect seabirds, which cross oceanic boundaries at will. "All the nations into whose waters these species range, must urgently ratify the treaty if we are to prevent extinctions." According to BirdLife International, two albatross species are classed as critically endangered, three as endangered and a further 12 as vulnerable. Conservationists are also hoping to collect more than 100,000 of signatures urging the United Nations to act against pirate fleets. RSPB director of conservation Dr Mark Avery said: "We need help to force governments to combat the appalling actions of these pirates. "This senseless slaughter must be halted before we lose albatrosses for good. "We are at the eleventh hour and face tragic consequences if action is delayed. "Albatrosses are some of the most evocative birds in the world. "They are a magnificent sight, gliding thousands of miles on globetrotting journeys across the southern hemisphere."